Attached Lid Containers | George Utz Ltd. Attached lid containers are sometimes also known as Croc Boxes or alligator crates, due to the interlinking lids which resemble teeth. The hinged lids are designed to allow the containers to be securely stacked on top of each other, and when the containers are empty they can be nested to save up to 75% of storage space. 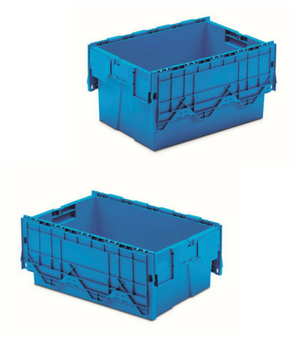 Suitable for a range of applications these attached lid containers are predominantly used within the retail industry to store and distribute goods from the warehouse or distribution centres to the store. Printing and labelling is also available for these plastic containers, so company logos and barcodes can be applied if required. In order to ensure the contents of the container have not been altered with, tamper evident seals can be used for added security. Dollies are also available for use with attached lid containers.